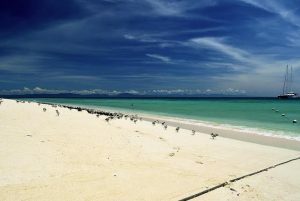 Two French tourists have died in the sea while snorkelling together at Michaelmas Cay on the Great Barrier Reef. In an extraordinary coincidence, the man and woman are believed to have suffered near-simultaneous heart attacks while on a snorkelling tour with Passions of Paradise off Cairns in Far North Queensland. ABC News quoted Passions of Paradise spokesman Scotty Garden saying the pair were understood to have had pre-existing medical conditions. The were initially described as being in their 60s, but reports this morning put their ages at a decade older. The victims were named as Jacques Goron, 76, and Danielle Franck, 74, both of France. They were with a guide while snorkelling. A lookout on the beach spotted the man floating in the water, pulled him ashore and performed CPR, without success. A second lookout then noticed the woman floating and pulled her on to a catamaran. Again, attempts at revival were unsuccessful. A third person is said to have suffered a similar “medical condition” – but survived. That person was later revealed to be an elderly partner of one of the victims, who collapsed with shock and had to be revived with oxygen. Col McKenzie from the Association of Marine Park Tourism Operators told ABC News the two deaths were a “rare tragedy”, an “absolutely stunning event, a tragedy for everyone involved”. He added that the Cairns-based rescue helicopter wasn’t available to help. “We’ve been really concerned about the lack of the rescue helicopter over the last few months,” he said.